To make the caramel: Place sugar in a saucepan over medium-low heat. Cook until the sugar melts, moving the pan so it will not burn, until it has a caramel consistency. Turn off the heat and pour the caramel quickly into individual flan or custard molds as you tilt them, so the caramel covers the bottom of each mold. The caramel will quickly cool and set. 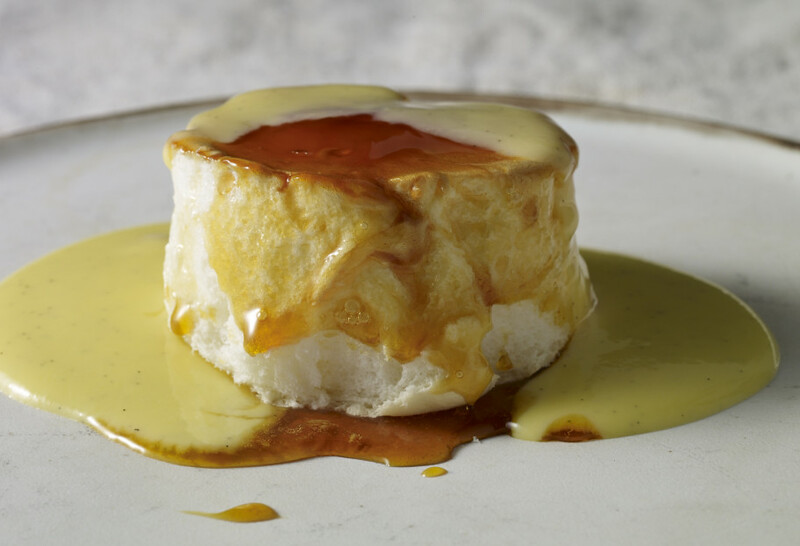 To make the floating islands: Preheat oven to 250 degrees. Place egg whites in a mixer with the salt and cream of tarter and beat until stiff peaks are formed. Add in the extracts and the sugar and mix until combined. Then top each of the molds with the egg white mixture. Place molds in a large baking pan. Pour about an inch of boiling water into the pan to create a water bath. Bake in the oven for about 25 minutes. The top of the islands will look browned and crispy. Turn the oven off, open the door oven slightly and let the islands cool inside of the oven for about 10 minutes, then remove them from the oven. To make the vanilla sauce: In a saucepan, lightly beat the egg yolks with 1/3 cup sugar and 1 teaspoon of all purpose flour. In another saucepan, heat the milk and vanilla bean (make a slit on its side and free the seeds into the milk). Let it heat until very hot but not boiling. Slowly, in a very thin stream, add the hot milk into the yolk mixture, emulsifying with a whisk until it is all incorporated. Place over low heat and stir until the sauce almost reaches a boil, and coats the back of a wooden spoon. Turn the heat off and keep on whisking slowly, for about a minute or so. The sauce can be served hot, warm or cold. It can be stored in the refrigerator for up to a month once cooled. Once the molds have cooled to room temperature, you can unmold them. Use a knife to go around the edge of the molds and carefully turn them onto a plate. Drizzle the caramel from the bottom of the molds on top of the islands. Add a couple tablespoons of the vanilla sauce on top. You may garnish with strawberries or any other fruit of your liking. Islands can be refrigerated in their molds, covered, for up to 4 days.